Congratulations to the KCD middle school speech team, who placed sixth in the state at the Kentucky High School Speech League’s Junior State Tournament on March 1–2 in Lexington. Eleven KCD students represented KCD at the competition. Six students advanced to semifinals in various events, and all six made it to the final rounds in at least one of their events. Seventh graders Minhal Nazeer and Anya Sharma were state champions in improvisational duo. Eighth grader Megan Delande took 4th in humorous interpretation, and eighth grader Avani Singal placed sixth in broadcasting. Seventh grader Seleen Maya placed fifth in the state for poetry interpretation. 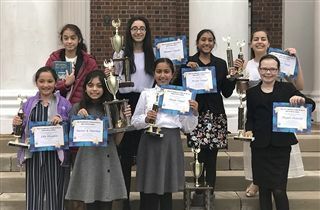 Rounding out the pack were sixth grader Lila Hayden, who placed fourth in storytelling, and sixth grader Naya Singal, who took sixth in prose interpretation. In addition, eighth grader Emaan Sayied was honored with the prestigious Blyton Book Award, an award given to one outstanding speech student who proves exceptional in two or more speech events and who promotes speech activities at their school. Congratulations to the team and to coach Francesca Price!